As the sole writer and owner of "Shopping Style and Us", I am not a buyer or shopper by profession. I’m a person with a passion for shopping anything and everything, sharing my experience with you. What I post on this website are my personal experiences and opinions without any outside influence. I understand my responsibility as a blogger and towards my readers and that is why I visit certain websites, shops, restaurants and markets so that I can share my experience best to my knowledge and be a source of information to all who read my blog. I am not biased towards any brand or website hence I would write from popular to non-popular products without any hesitation and with honesty. What I choose to review on "Shopping Style and Us" is based on my own experience with a product/website/store. These are my opinions and it may differ from one or all. Everyone is different and may not have the same experience as I do. Results may vary based on a number of factors. I am not liable for any variation that occurs due to a purchase influenced by this website. Please use all items featured on my blog with a caution and your own decision. However, you may contact me [shoppingstylenandus(at)gmail(dot)com] or leave a comment for any queries. The Headers of the blog has been taken from creativecan. Product Reviews: There are many products from latest or old collections will be bought by me for review purposes. I would do so only because I think it may interest my readers and be useful for them. I would appreciate any suggestions, comments in regards to this. Website Reviews: I am not being paid to write about any website. This is my personal obsession of shopping online. I just happen to find websites online and talk about them if I find them to be genuine. Later or sooner I will buy from them, write a review and tell you if they are real or fake. In this course I do lose some money and I don't get any benefits out of it. Store Reviews: I also love to review stores but that does not happen quite often because most of the stores are not comfortable giving pictures. I don't know the reason behind that. However, if I feel a store is friendly and open for me to review it on Shopping, Style and Us - I will do that. I am not affiliated with any of the brands mentioned on my blog. I do not endorse them and they do not endorse me. I am not paid for my reviews. I receive samples for consideration and same will be mentioned in the footer of the post. A few products reviewed on this blog are samples sent by brands or PRfirms . I make no promises regarding reviews or the nature of my reviews when accepting samples. The items I choose to post are products I want to write about and my reviews are my 100% honest opinion. Shopping, Style and US was started initially to express the love for shopping, to rant and rave about products. I like to shop and buy gifts for my near and dear ones. As the time passed, I realized that readers come in the same category of my dear ones. So, technically I should be doing the same with for my readers. I try to host giveaways quite often as my pocket allows or I am contacted by a brand for a sponsored giveaway. Since I can NOT shower everyone with gifts every time I host a giveaway, I can definitely choose one person for the giveaway (if my budget allows there may be more than one). So, I chose this path to say "Thanks" as being a shopaholic this is the best I can do for you. I will give you an opportunity to shop or I'll shop for you. I mostly choose websites for hosting giveaways as it is easier to ship the products. Also, I choose only those websites which are considered trust worthy and have faithful buyers. Sometimes, I send the gifts through courier. Post about the giveaway on Facebook Wall and tag me. I will mention if my giveaway is sponsored and mention their rules separately. 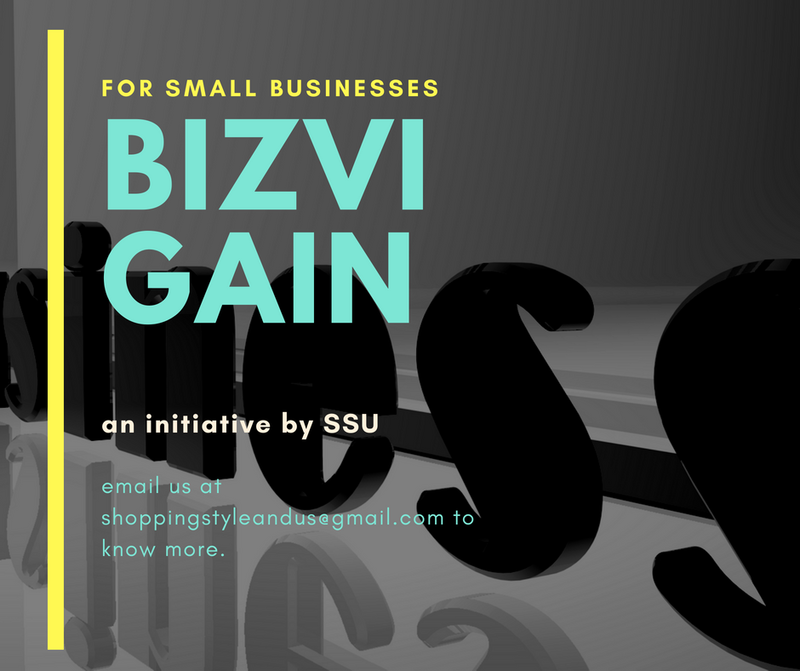 Shopping, Style and Us welcomes brands, stores and companies to host a giveaway for SSU readers. I also believe that a giveaway is better option to advertise one's brand. company, store on a website. Currently, my giveaways are being hosted through Rafflecopter. Please send me an email if you have more queries or leave a comment. Shopping, Style and Us accepts sponsored posts but sticks to only two posts a month. The media kit will be provided to them who are interested in it. For my readers, it will be clearly mentioned if a post is sponsored or not. Also, I always make sure that the post would be beneficial for my readers. Shopping, Style and Us abide by Google Adsense rules and policies. It does not accept any affiliated programs other than that. However, if joining your affiliate program does not violate the rules/policies of Google Adsense, feel free to write to me about all the necessary details. Occasionally images found on the web and believed to be in the public domain are used on this site. I don’t claim to be the owner of such images. All visual content are copyrighted to their respectful owner. If you are the owner of an image and want it removed, please, email me [shoppingstyleandus(at)gmail(dot)com] and I will do so as soon as possible. Plagiarism is defined in dictionaries as the "wrongful appropriation," "close imitation," or "purloining and publication" of another author's "language, thoughts, ideas, or expressions," and the representation of them as one's own original work. I am, of course, against it and so not in favor. I would abide by the cyber rule and pay a respectful mention of the owner of the image, idea etc in my blog. It may be possible that the source I will mention is not the original source but for me that is. Kindly follow the links to find the original source. I would mention it in case I have the proper information. This blog is a personal blog written and edited by me. For questions about this blog, please contact at shoppingstyleandus@gmail.com .